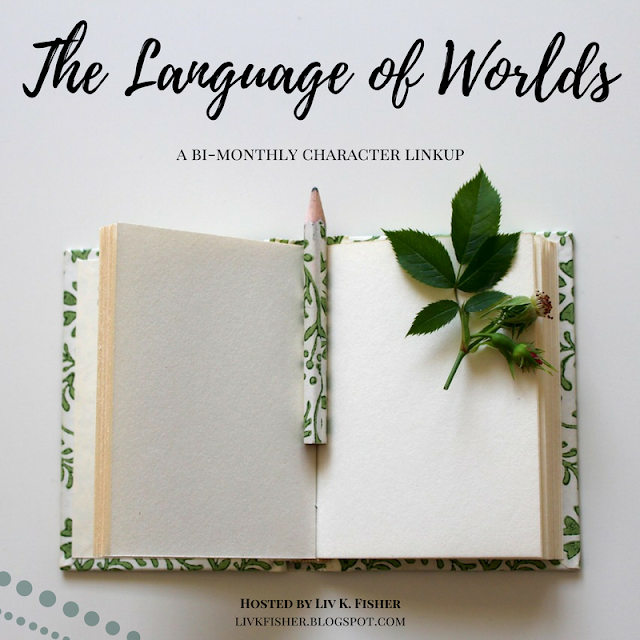 Can Godfrey and his faithful retinue -- Chim the Hobgoblin, Rebecca the Jewish Maven and healer, and Jack the sometimes human and sometimes seven-foot Black Dog -- keep her safe and convince her that her calling is worth pursuing? Or will she succumb to the Key's lure and wield it for revenge? T.J. Akers desires to be a multimillionaire when he grows up and give his wealth to his favorite causes: churches, schools, and animal shelters. Since the millions have been slow in coming, he's settled for working as a computer technician for a state university and volunteering at his church and local animal shelter. Whenever possible, he indulges his love of writing to entertain people, especially young readers. 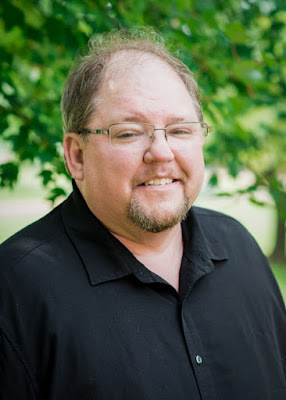 Akers holds a masters of English from Minnesota State University, Mankato, and can often be found roaming the university's library, especially the children's and young adult sections. Librarians have always been his heroes. He lives with his beloved wife of thirty years, his dog, and two cats. The dog is an excellent writing companion, but the cats have proved to be rather critical. 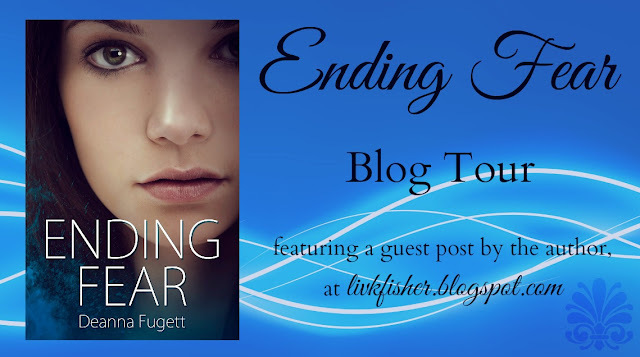 Learn more at tjakers.com. My new novel, The Final Paladin, is a fantasy novel that takes place in a particular time and place of U.S. history. Of course, this is no history textbook, but I do try to keep with the spirit of the time. 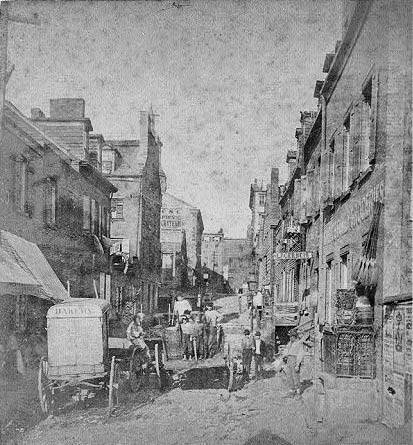 For this novel, my heroine, Peg Bowmen, starts the novel in her home in the New York City neighborhood of Five Points in 1870. According to webpage.pace.edu, the neighborhood formed in 1820 and grew rather quickly. It was next to a lake fed by a spring, but in no time, the lake became a collecting pool for waste and sewage. It was so polluted that the people of New York City drained the lake and filled it completely in. The excavation was poorly done, and in no time the lower southeastern end became a swamp. Property values plummeted, and just like today, those well off and able to move did so. Those who couldn’t move had to stay. From that came the infamous slum called Five Points. In 1854 there were five streets that intersected each other. They were Cross, Anthony, Orange, and Little Water. The name for this neighborhood came from the fact that all five streets poured into a common spot (note the star in the graphic). Later, the names were changed to Worth, Baxter, Mosco, and a public park called Paradise Square. Tyler Anbinder, Five Points (New York: The Free Press, 2001). This image below is from Getty Images is from circa 1829. Note the five corners. It's mentioned that Peg and her brother, Archie, would attend (a.k.a. sneak into) the theater. There were no televisions, radio, or movies. Any music had to happen live. The only source of entertainment outside of drinking establishments or church came from live theater. 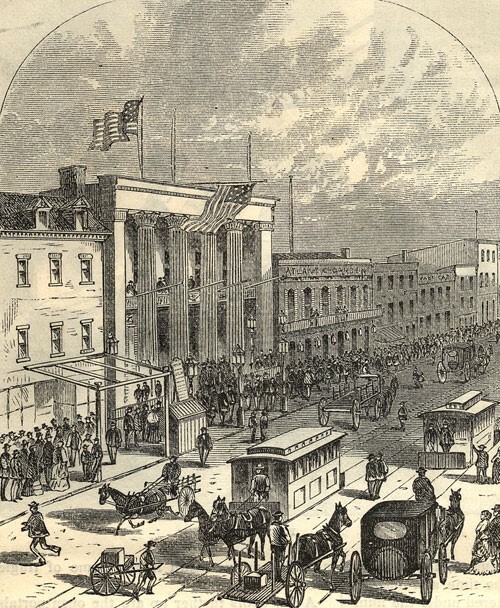 This picture below is of the Bowery Theater which was originally published in Harpers Weekly April of 1871. The Bowery Theater picture from the Collection of Maggie Land-Blanck. Class differences abounded. In Uptown, where the more prosperous lived, the theaters would have opera and music recitals. Down in the Bowery they would have melodramas, Shakespeare, and variety acts. By 1850 and 1860, straight variety grew popular with the masses. Of course, in 1870, where my story takes place, the acts would have been on the racy side. Tony Pastor, a ballad and minstrel singer, is credited both with giving the first performance of what would come to be called by 1881, Vaudeville. Personally, I think the Bowery had better options. New York Public Library ID 805681. I mention cheap seats in my novel. 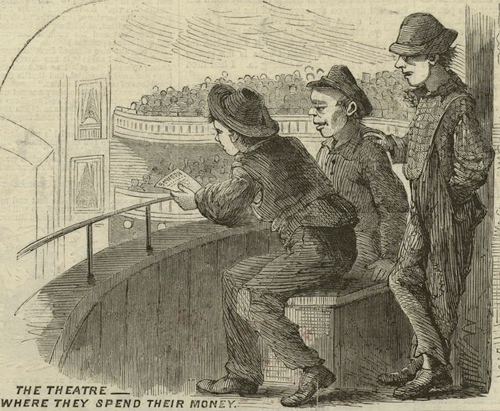 In theaters of that era, the cheap seats would be nothing more than benches right up against the Orchestra pit, or up in the nosebleed sections. Notice the clothing of the boys and the wooden bench they're seated on. The more expensive seating was plush and centered at stage level on the ground floor. Forcing children to work is, and has been, a complicated issue for a long time. Peg worked at the Shirtwaist Factory sewing clothing. The sewing machine existed in the 1870s and was used for home and commercial uses. The factory mentioned in my book actually opened in 1901, thirty years after my story takes place, but such places did exist. 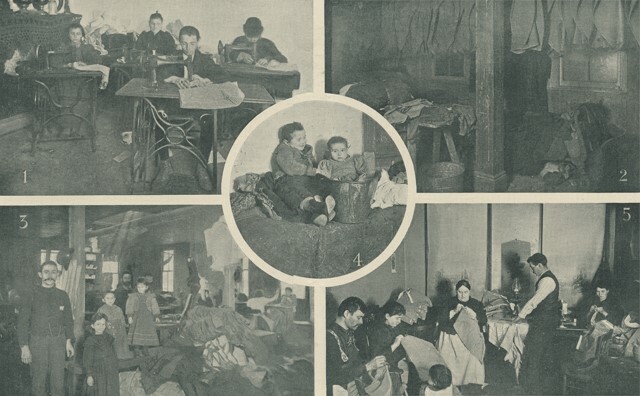 Whole families often sewed in small rooms for a living. 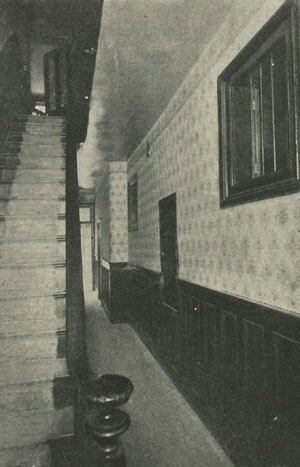 The picture below is from Harper's Weekly 1895. Since the neighborhood was built on a bog, water drainage was a problem. 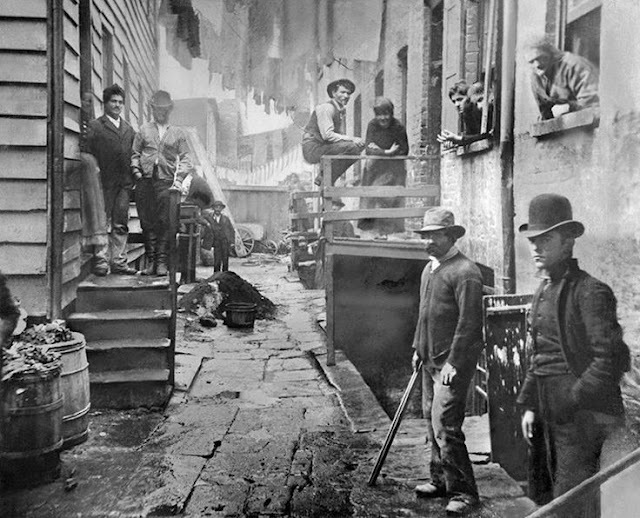 The streets were often wet, and keep in mind that most people threw their waste out on the street. The photo below was taken by John Rii, the Danish-born, investigative journalist. 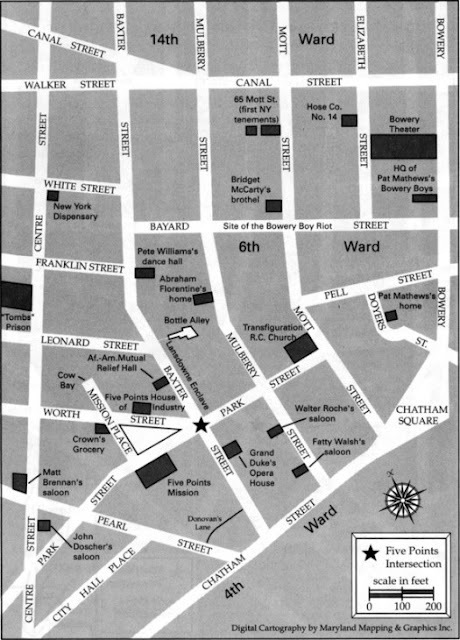 Note the stone street. This was where I got my idea for the opening scene. Bandits' Roost -- Circa 1888. Electricity didn't exist for homes in 1870. All the apartment buildings had to use natural light. Note In the picture below, the long narrow window at the end of the hall. This was the only way to light these places during the day. Imagine how dark they were at night. Some of the tenements even hired someone to keep the halls and bathroom, if they had one, clean. Since Five Points was built on a swamp, and the building were neither cooled nor heated, escaping the temperature was hard. 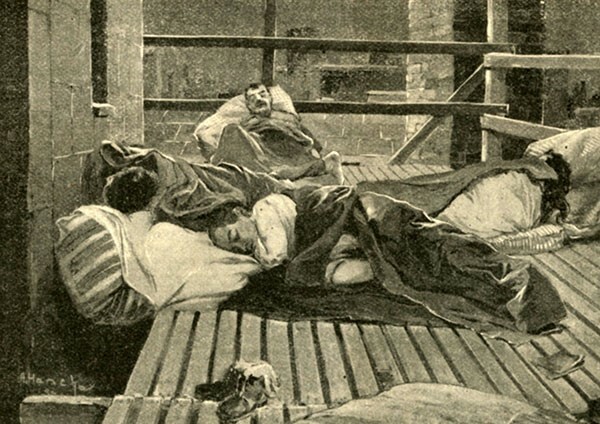 Many people slept on the roof during the summer. Harper's Weekly, date unknown, Collection of Maggie Land Blanck 2013. Peg and Archie would have slept on their roof in the summer. New York was an international port of call. Goods were shipped to New York harbor by barge on the Hudson River, or goods arrived on ship from ports all over the world. Barges weren’t motorized, and ships needed help getting towed into the harbor. There were two ways to do this. The first, a tow boat or tug, which existed in Peg's time. 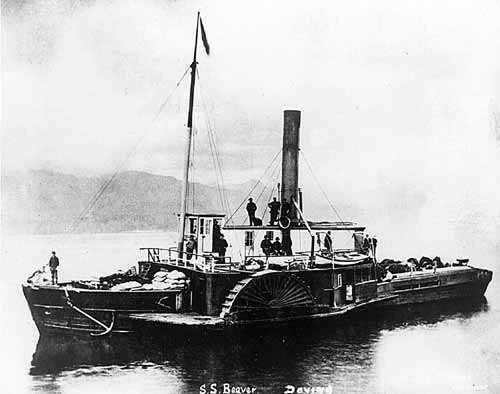 Tugboat Beaver, taken in 1870. Of course Peg travels by barge on a canal to go further upstate. 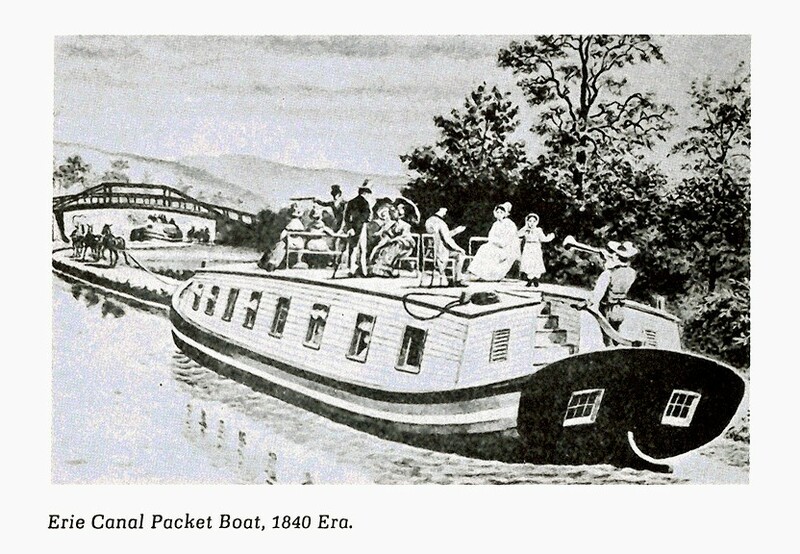 The barge, or packet boat, would have been pulled by horse or mule, because the canals wouldn't have been large enough. Horses and mules were used up through the early twentieth century for river travel. Some sources have them working as late as the 1950s. So to be sure that I'm not playing too fast and loose with historic detail, here are some of the sources that inspired the beginning of The Final Paladin. Thank you for your time and kind attention. 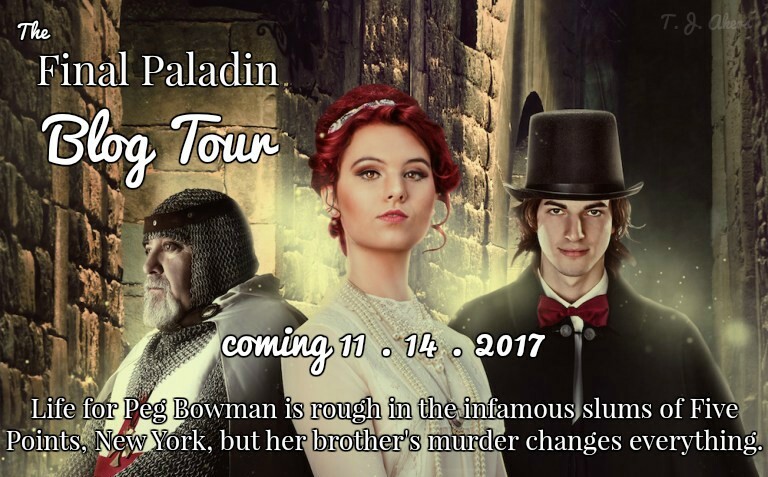 I hope you will check out The Final Paladin. 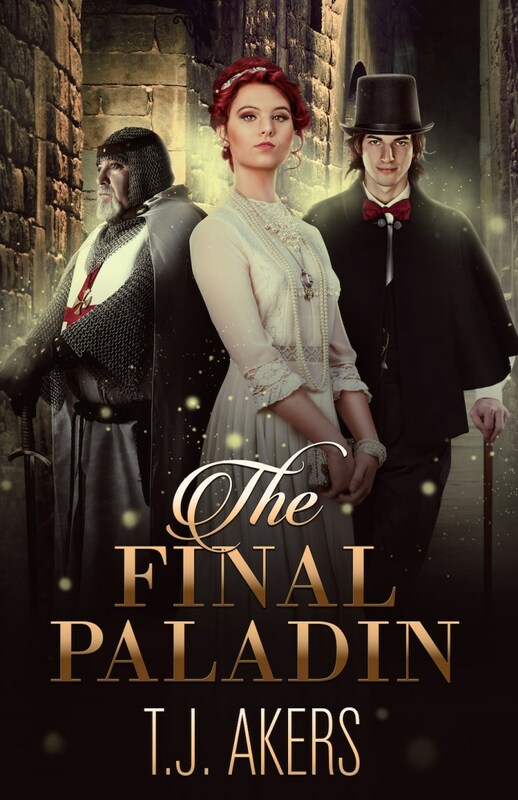 Dragons, you can pre-order paperback and kindle copies of The Final Paladin on Amazon! Have you ordered The Final Paladin, yet? 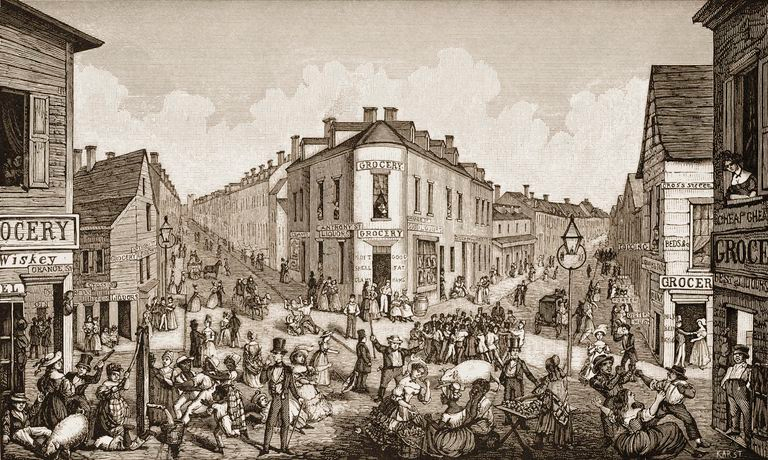 Have you ever explored the history of Victorian New York? 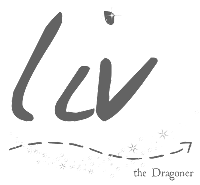 This December: LITTLE WOMEN Read-Along!